A pair of leggings for pregnant women for your comfort A pregnant woman undergoes great physical and emotional changes during her pregnancy. Hormonal fluctuations, physical strain, weight gain, increased belly size, tiredness are some of the common symptoms that every woman experiences till the period of child birth. Right maternity apparel gives great comfort. Improper clothing during this period gives great stress to the body, which results in tiredness. Maternity leggings for your changing body Being pregnant is a great excuse to buy a new wardrobe, but if you want to keep things to a minimum, you can just spend on really necessary pieces that will last through your pregnancy. One of these pieces is a pair of good leggings. The maternity leggings are designed to fit changing body and growing belly. They can give a great comfort to carrying women. The thing is during this time, the skin becomes very sensitive. Leggings for pregnant women are a kind of apparel that sticks to the skin very gentle and takes the structure of the legs to appear skinny. Maternity leggings fit perfectly on the body and at the same time they stretch loosely to give a breathing space to the skin, making it feel super soft and comfortable. They can be dressed up or down, these are go-with-everything leggings. You can pair them with tunic tops, loose dresses or even comfortable long shirts. High quality and well-made maternity leggings last throughout all of the pregnancy stages. Finding right maternity leggings is not an easy task and very challenging. 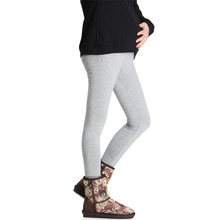 Keeping the feelings of a pregnant woman in mind, we stock a great selection of leggings for pregnant women. We have cozy cotton pregnant leggings for your comfort, maternity elastic pants for growing belly and even leather leggings for those who want to look trendy and stylish. Check out the full row of models, sizes and colors of our leggings for pregnant women.